Hello friends! What happens between Germany and Russia concerns all of Europe. To create dialogue and common ground with "the other side" is the most important work we can do in order to decrease tensions and work for peace and stability in Europe. 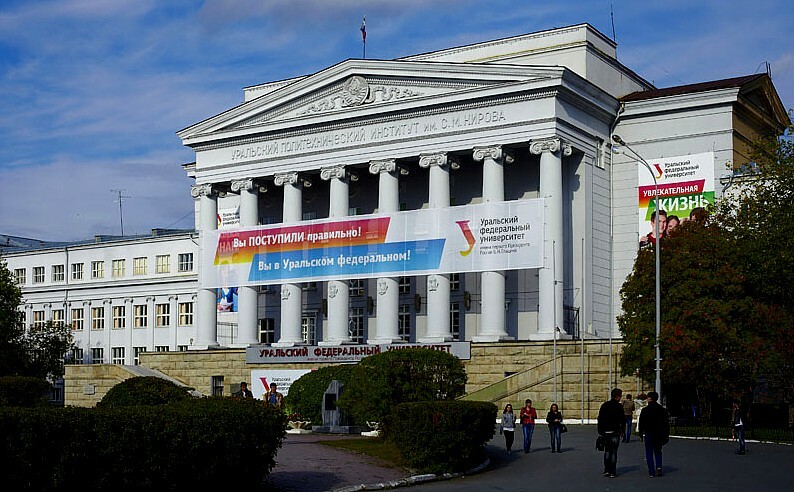 ﻿German Foreign Minister Frank-Walter Steinmeier was recently in Russia and held an important speech at Ural Federal University. It is perhaps the most important speech held by any Foreign Minister in our time.﻿ Please read it below. Keep your eyes and ears open, together we shall fight terrorism in all it's uglyness. Have a really good day all of you! 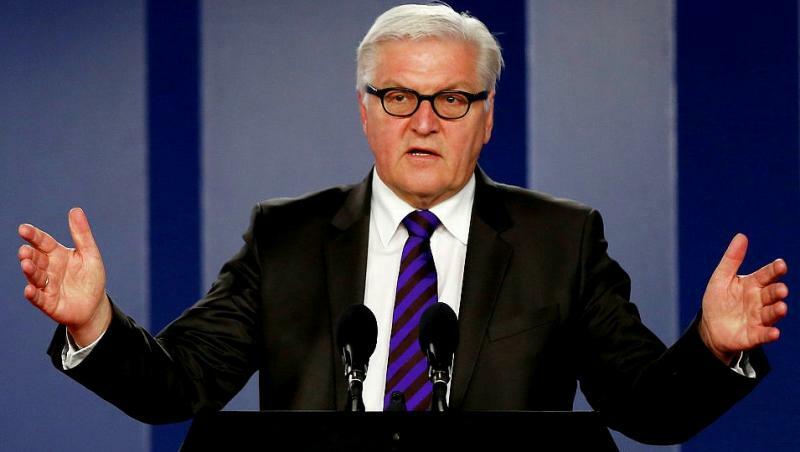 SPEECH BY GERMAN FOREIGN MINISTER FRANK-WALTER STEINMEIER AT URAL FEDERAL UNIVERSITY IN YEKATERINBUR, RUSSIA. "Perhaps the most important speech held by any Foreign Minister in our time." Yekaterinburg University is a special place for me. It is great to be back in Yekaterinburg! This is the sixth time you have invited me to give a lecture at Boris Yeltsin University, which is one of the most renowned universities in Russia – and a very special place for me personally. Rector Koksharov, six years ago, in December 2010, you awarded me an honorary doctorate on behalf of this University. I was not only greatly honoured to receive this award – I also saw it as a sign at the time. I saw it as a sign of a new departure in German-Russian relations; a sign of encourage- ment for a partnership between our countries, not just on the political level, but also and in particular between universities and schools, associations and civil society organisations, and towns and regions – in the final analysis, a partnership based on the ties between you and me, between the people of our two countries. To this day, I regard the honorary doctorate from your University as a huge compliment. It is important to me to return here regularly and to talk with you, the students. 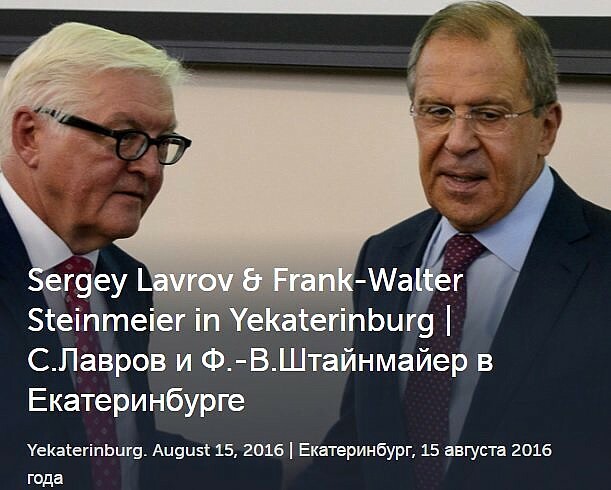 Over the years, Yekaterinburg has come to stand for how I personally see Russia and German-Russian relations. It is a place of dialogue and shared reflection. And to a certain extent, it also serves as a gauge of our relations. Eight years ago, in 2008, I presented the concept for a German-Russian part- nership for modernisation here. It was drawn up in spirit of great optimism and high hopes for collaboration in many practical areas, ranging from ener- gy supply and the modernisation of industrial infrastructure to demo. grapic issues and the health system. There is no doubt that one hope of this initia- tive was to achieve a closer partnership in even more fundamental matters – democracy, the rule of law and shared responsibility in the world – by work- ing together on practical issues. We worked on this in the following years and we got some projects off the ground. However, we must admit that many – indeed, most – of these hopes were not met. And I do not want to hide the fact that I am disappointed about that. If Yekaterinburg is a gauge of our relations, then this goes both for the highs and the lows in German-Russian relations. The last time I was here, in December 2014, was my first visit following the annexation of Crim- ea by Russia, in the midst of the escalating Ukraine crisis – a low point in our relations whose impact we have still not overcome. but rather to seek dialogue, even if it has become more difficult, and to maintain this dialogue sincerely, respectfully, critically and, above all, with a focus on solutions. This is why I was happy to come here again to speak to and with you. Away from the hustle and bustle of crisis meetings, which currently dominate the agendas of us foreign ministers, I want to take the time to speak in some. what greater detail with you about the relations between our countries, Ger- many and Russia, and to do so in the context of a world that – as our two countries agree – is becoming increasingly unclear and complex and unfortu. nately also increasingly dangerous and conflict-ridden. I want to start by posing a fundamental, and perhaps even provocative, question: can we actually read? I see that some of you are now looking at the person beside you and asking if I really just asked that question here at a university. I am fully aware that the ability to read is one of the essential requirements at a university. That is the case in Germany and it is no different in Russia. However, I am talking about something else: can we read each other? In German, that means are we capable of listening to other people, communicating effectively with each other and correctly interpreting the signals other people send? To put it briefly, are we able to understand each other? This reading does not only involve the other person, but also the lenses through which we read that person. These lenses are shaped by our own experiences, opinions, prejudices, background, culture, dreams and traum- as. This means that the ability to read is anything but trivial. But is is of the utmost importance, particularly in a world of increasing physical and media mobility; a world that is growing closer; a world in which societies, cultures and traditions are being thrown together virtually unchecked. I would like to mention just one example from my own field of foreign policy. There are often problems in this field, too. We read each other badly. Either we don’t read each other at all and merely swap stereotypes instead or we unthinkingly and often mistakenly fall for the belief that our point of view and our signals have been understood correctly by the other side. I believe that this also applies to German-Russian relations. It is often not easy to filter out the correct signal from the large number of simultaneous signals. Which statements are meant rhetorically and which are meant lite- rally? For example, some Russian experts say we should have foreseen the events and conflict in Georgia in 2008 after the dramatic speech by the Russ- ian President in Munich the previous year. At the same time, they say we should not take every dramatic and exaggerated statement made in Russia on the security situation literally. So what should we take literally? And what should we see as rhetoric? When should we be worried and when should we remain calm? Let us take Syria as an example. Russia’s military intervention came as a sur- prise to the West. We weren’t able to gauge the aims, means (observers or combat units) or weapons. Or let us look at Crimea. At the start, the talk was of “local self-defence forces”; later on, the “little green men” appeared, and later still we heard that special forces had also been deployed. I know that these are very direct and very concrete examples. However, I think it is important to ask these questions honestly. And I am certain that conversely, the Russian side also has questions it would like to ask of Ger- man or European foreign policy. I have come here today so that we can ask each other such questions openly. We should trust in each other to do that. And we should also trust in our ability to question ourselves. You are also welcome to ask me questions today. You can ask me what German policy means or what signals is the West sending. It is better to ask something again so you can read correctly than not to ask at all and then to misread something or someone. That is the case at university and it is no different in politics. After all, both sides must have an interest in avoiding misunderstandings, especially in se- curity policy and in these tense times, where misunderstandings can quickly lead to overly hasty decisions. We must be willing to prevent such misunder- standings by maintaining our dialogue with each other. This means that be- fore one is able to read, one must want to read. One must want to under- stand. I am concerned that our interest in each other is declining on both the Ger- man and the Russian side. In political discussions, we sometimes hear opini- ons expressed by people who are not interested in the slightest in under- standing others; people who have already made up their minds about the other side; people who don’t even bother reading because they think they already know the answer. Particularly now, at a time when there are many serious problems at the political level between Russia and the West, I think this is extremely dangerous – as if conflicts or escalations only serve to con- firm supposedly absolute truths, that is, the antagonism of the West towards Russia. You find such opinions both in Russia and the West. And I think both are wrong. Politics should never move in categories of absolute certainties – by doing so, it would condemn itself to failure or make itself superfluous. And if the aim of foreign policy is to resolve conflicts and preserve peace, then this supposed antagonism between the West and Russia must never be allowed to become a category, let alone an ideology. I am also concerned that the willingness to read and the interest in each other is declining at the level of society. This literally starts with reading, when one learns the other country’s language. Over a million young Russian are learning German. This makes German the second most studied foreign language in your country after English. However, the numbers are declining. I hope we can consolidate and expand the interest in learning each other’s language in our two countries. To this end, we launched the German-Russian Language Year two years ago. The introduction of a compulsory second for- eign language at upper secondary level last year has provided new opportu- nities to learn German. We should make use of these opportunities. I am also worried about something else. The number of young Germans and Russians who took part in a school exchange last year fell from 11,000 to 7,000, and in this Year of German and Russian Youth, the figures are by no means as high as we would like. No doubt there are many reasons for this, but one reason is the loss of trust, unfortunately also on the level of society. This must motivate us to put our heads together. Lost trust must be a reason to speak more, not less, with each other – a reason to ask how we actually see each other and the world around us. Why do we allow a lack of know- ledge and mistaken perception to influence our image of each other? One person should serve as an example to us, someone who helped to foster understanding between Germans and Russians throughout his life. His name was Lev Kopelev. He was born in Kyiv in 1912 and fought for the Red Army in the Second World War. After the war, he lived in Moscow, later mov- ing to Cologne. No other person has studied the images that Russians and Germans have of each other as thoroughly as Lev Kopelev. In his most im- portant study, the Wuppertal Project, he describes the chequered history of the image of Russia in Germany and vice versa from the beginning. His study comprises ten volumes and covers 1,000 years of history. No one else has ever tried to read the “Other” in such detail, to explore the full range of views, fears, hopes and contradictions. I think we should follow in Lev Kopelev’s footsteps. I don’t mean you should also write ten books – I’m sure you already have enough to do! But I do think we should retain our curiosity about each other and the courage to approach each other and to ask each other questions, including critical questions. After all, one of Lev Kopelev’s firm beliefs was that how others see us allows us to see ourselves. It was no coincidence that he called his study “Western-Eastern Reflections”. It is time to update these reflections. A survey by the Hamburg-based Körb- er Foundation helped to do so by asking Germans and Russians about how they saw each other and themselves at the start of the year. The good news is that there is still a great deal of mutual respect and willingness to work together among both Russians and Germans. Ninety-five percent of Ger- mans regard Russia as a country with long-standing traditions and a great culture. For their part, 86 percent of Russians see Germany in this way. An equally high percentage of people is in favour of Russia and the EU becom- ing closer once again on the political level in the coming years. And I can assure you that I also belong to this group! However, the findings were very different as regards whether or not Russia is a part of Europe. 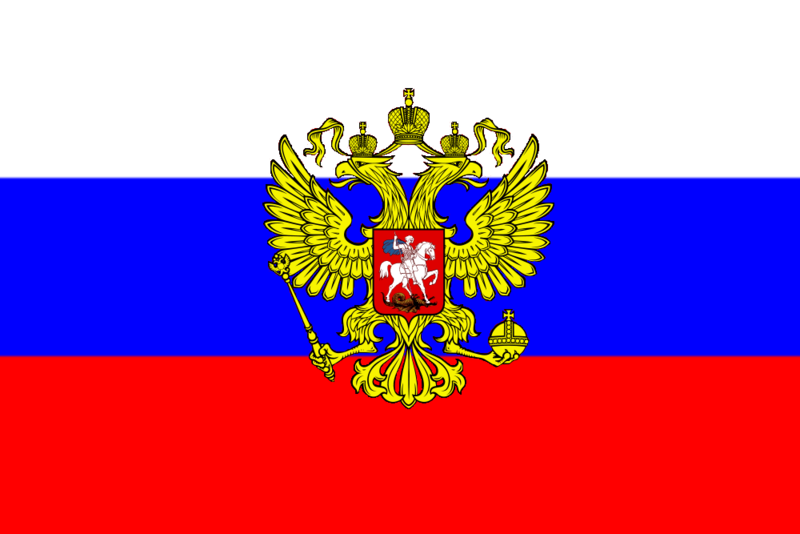 Fifty percent of both the Germans and the Russians sur- veyed stated that Russia does not belong to Europe. The number of those who do not see Russia as a part of Europe has grown in Russia. In 2008, only a third of those surveyed – not half – saw Russia as being outside Europe. The data from this survey give us a certain insight into how we see our- selves and the other side. But they are only a small part of the picture. The way we see ourselves and others is a result of countless perceptions and viewpoints, and the latter are not static. That is why Lev Kopelev was able to fill ten volumes! We need to be curious and we need to ask each other questions in order to combine these many viewpoints. I have brought along a list of questions I would like to ask here today and I am certain that you students will also have your own questions. We should ask these questions honestly and show how and where we see things diffe- rently. First of all, I have questions about our recent history, about the order by which we live or want to live. When we think about 1989-1990 and the following years, many Germans and Russians have very different association. We Germans remember our country’s reunification and the great moment when all CSCE participating States, including Russia, signed the Charter of Paris in 1990, with the aim of overcoming the division of Europe and ending the age of confrontation. But at the same time, we Germans need to ask ourselves self-critically if we saw the 1990s too globally as a time of freedom or even democracy and if we are ignoring the negative effects of a completely unregulated transition from a planned to a competitive economy – especially the radical privati- sation of state assets and companies in the former Soviet Union, including the transfer of capital to privately held foreign bank accounts. Weren’t we in the West sometimes too quick to see cases of ruthless personal gain to the detriment of society as a necessary side effect of a free market economy? Did we perhaps overlook that individual freedom needs to go hand in hand with the use of freedom for something, for a more equitable society, for educational opportunities, for responsibility for the community? These are difficult questions. And of course, there are similarly difficult questions as regards security. In the 1990s, there were terrible conflicts, for example in the Balkans, but at the same time, many European countries moved towards democracy and prosperity, in some cases doing so indepen- dently and without outside interference for the first time in their history. But here in Russia, many people wonder if they should see the accession of so many countries to the EU and above all to NATO as a threat. In 1997, we signed the NATO-Russia Founding Act and set up the NATO-Russia Council with the express aim of diminishing the feeling of mutual threat. However, we need to ask ourselves if we – and I mean both sides – truly breathed life into this Council by setting up concrete confidence-building projects or if we simply looked after the administrative side. I certainly advo- cate making use of the opportunities afforded by the NATO-Russia Council, particularly in difficult times. At the most recent NATO summit in Warsaw, this was reiterated as a political responsibility, and the NATO-Russia Council met again after the summit, at least at ambassador level. There are also great differences as regards recent history and the question of where and when the fractures in international relations that fundamen- tally changed our relations occurred. We need to ask ourselves if we accept the rules of a peaceful order, which we ourselves set up, in order to overcome the centuries-long logic of confrontation. Do we respect and protect other countries’ equality and sove- reignty and do we only agree to borders being changed on the basis of people’s right to self-determination when such changes are made in accor- dance with inter- national law? I would like to answer these questions in the affirmative. And I would like Russia – as a permanent member of the UN Security Council and the largest multi-ethnic country in the world – to also answer them in the affirmative. While we are on the subject of state sovereignty, we also need to ask the following question: if countries are sovereign, how are the rights of minori- ties within these countries protected? Some people in Russia asked “If the Russian-speaking population in Ukraine was in danger after the upheaval of 2014, didn’t we have to protect them?” If the majority of people in Russia answer that question with “yes”, isn’t it understandable that other countries with Russian-speaking minorities, for example the Baltic countries, are now also worried and asking themselves what might happen? Our position on this is that the principles of sovereignty and non-interven- tion do not allow a country to style itself as a protector of ethnic groups in another country. But conversely, a country’s sovereignty has clear limita- tions. As regards the individual, these limitations are laid down in the Uni- versal Declaration of Human Rights and can even lead to an international responsibility to protect if they are not respected. If countries demand that other countries respect their sovereignty, then they must ensure that the rights of the people within their borders are protected. That is precisely what we told our partners in Ukraine, for example when we were discussing Russian language rights. I believe we must demand that every country, as a member of the international community, respects the rights of all of its citizens – and to that I would add particularly in this world, in which people are becoming increasingly mobile and societies are becom- ing ever more diverse. And if this were not the case, if this responsi- bility disappeared, wouldn’t that be very problematic for a multi-ethnic country like Russia in particular? This brings me to the third area where it is worth asking each other quest- ions. How should societies live together today? What values are important to us in our democracy? How do we deal with immigration and growing diversity? Is this an opportunity for our society – or a threat to it? I know that many people in Russia have been following the German Govern- ment’s refugee policy and asking how we in Germany are planning to take in and integrate so many people. Some are even asking if this will lead to the end of our democracy. We are not naive. We also have to answer similar and other questions in Germany. Our principle remains as follows: people seeking refuge from war and violence have a right to protection. This has often been the case in hist- ory, for example in the 17th century, when the Huguenots had to flee France, and in the early 1920s, when several million Russians fled to the West from the civil war. And it is the case today. This is a question of human- ity – and everyone should do what they can to help. But how to deal with the refugee situation is not the only question. We also need to look at the reasons why people flee. We need to ask ourselves, both in Germany and Russia, what responsibility we have to put a stop to the deprivation and violence that forces so many people to flee. Obviously, I am thinking about Syria. I firmly believe that we can only end this terrible conflict by working together. Russia has a particular respon- sibility here, especially now in Aleppo, as regards the ceasefire and humani- tarian access. The situation in Aleppo is unbearable for the people there. We need a ceasefire so that the local population can be supplied with essential goods. But looking beyond that, when a period of reconstruction finally starts in Syria, then Germany and Russia in particular should work hand in hand in Palmyra, Aleppo and Homs, to name just a few examples. I firmly believe that if we take on joint responsibility for humanity’s cultural heritage in this crisis-ridden region, then we will also be doing something to foster cultural ties between our two countries. On the German side, we have pooled our expertise in the Stunde Null (New Start) project, and I would be delighted if Russia accepted our offer to work together. At the start of my talk, I said that those who want to read and understand each other must ask themselves and each other questions. This is what I have done today, and I hope you will ask many other questions in the dis- cussion after my talk. One thing is certain – we will not answer all of the questions today. This is why I would ask you to see my speech as an invita- tion to an ongoing dialogue. The questions we are touching on today show how different our perceptions are and how urgently we need to improve our mutual reading skills. This is why I advocate dialogue, that is, a two-track dialogue on what binds and divides us. My hope is that we will learn how to read each other better through this type of dialogue. And at the start, readers have many questions – and not so many answers. During the Second World War, Lev Kopelev fought in the Red Army against the Wehrmacht. Heinrich Böll fought in the Wehrmacht against the Red Army. A few years after the war, they met and became close friends. Heinrich Böll invited Kopelev and his wife Raissa to Cologne, where they lived until their deaths. The story of this friendship serves as a warning, but also offers a message of hope. It is a warning against the extremes found in German-Russian relations. And at the same time, it is a message of hope for understanding, which was possible then and – I am certain of this – also possible today. Despite all the difficulties between our countries, this is why we must ap- proach each other and make use of the channels we have, such as the Petersburg dialogue or the summer school that is about to start here. This summer school is an encouraging example of how the young generation of Germans and Russians is meeting. We need to find common ground and we need to work together. This applies as much to the big issues – war and peace, Ukraine and Syria – as it does to relations between the people in our two countries. We from the older generation are counting on the will and readiness of the younger generation to take on responsibility. Please remain curious about each other’s country and work towards a good future in German-Russian relations. That is what I ask of you. Thank you very much.